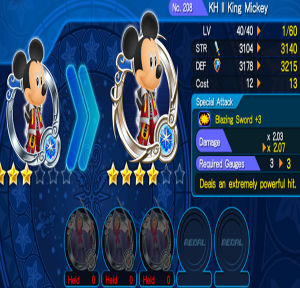 Welcome to the Kingdom Hearts Unchained X General Leveling Guide. Prepare to fight against the Heartless as we will take you through what Lux is, how to level your Medals and how to level your Keyblade in this Kingdom Hearts Unchained X guide. Is it Experience or Lux? 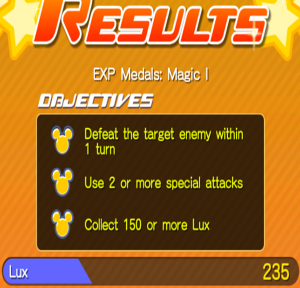 In Kingdom Hearts Unchained X you collect “Lux”, the games version of experience. You gain this from beating enemies, completing objectives, finishing stages. At the end of a stage you will see a meter that shows you how much Lux you accumulated from the stage you just finished. You will progress at a nice and steady pace if you follow the stage progression without repeating stages, however, depending on the Medals you’re using you may find it difficult to clear a stage without leveling up a bit more. You can continuously repeat a stage as long as you have AP available to use. 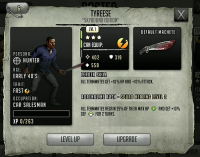 As your character levels up you will unlock more items in the Avatar board for both male and female characters. The Avatar Board is the clothing and accessories shop for your character. Each outfit from the Avatar Board has its own modifiers you can unlock to enhance your character. 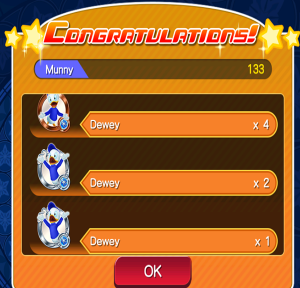 As you collect and exchange Medals in Kingdom Hearts Unchained, you will get various types of medals that require you to either level them up or evolve them. The standard level progression for a medal is done by sacrificing other Medals and spending some Munny. 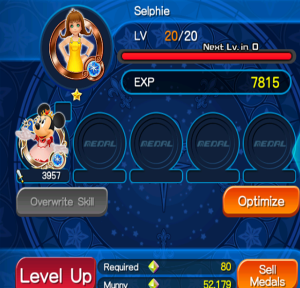 You will get more XP if you use a Medal of the same type either Magic, Power, or Speed and by using lower or higher tiers. Below is an example of how easily higher tier Medals fill out XP. You can use the optimize button to have the computer automatically choose which are the ideal medals but sometimes this can cause it to waste XP by using more medals than you need to achieve the same level. Evolution or Evolving a Medal adds a +1 for every stage of evolution. 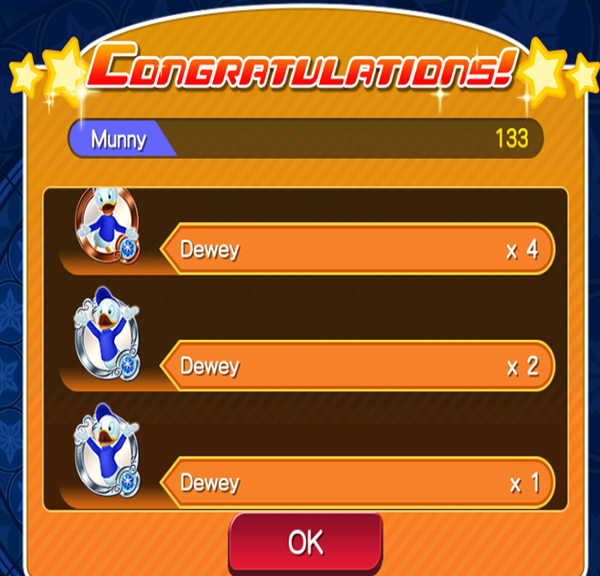 Evolving your Medal requires special materials you will find throughout the game. Each time you evolve a Medal, its stats are higher than its current highest or maxed out level. But its level will reset to level one and then you have to level it up again if you want to evolve it to a higher tier of Medal. This allows your Medal to stay progressively stronger or in line with the stages. The Keyblade is your primary weapon, holding several Medals and having its own special attack gauge. There are 5 different Keyblades available at this time. You will have to decide what fits your playstyle and medals, and enhance your Keyblade around that. I prefer the Starlight Keyblade as its well balanced and great for powering through stages, when it comes to more difficult raid bosses or specialized fights however is where another Keyblade can really shine. The special attack gauge is used by your Medals. 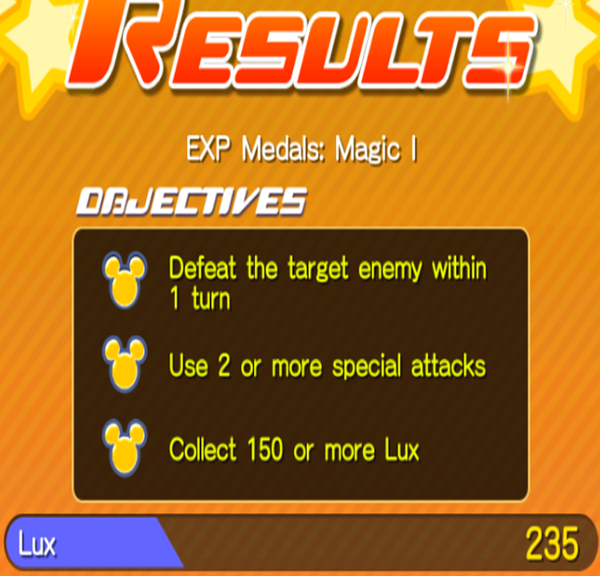 For example, a medal that requires 3 special attack to be used will require at least 3 special attack gauge. You gain special attack gauge by killing enemies and it carries over between stages. 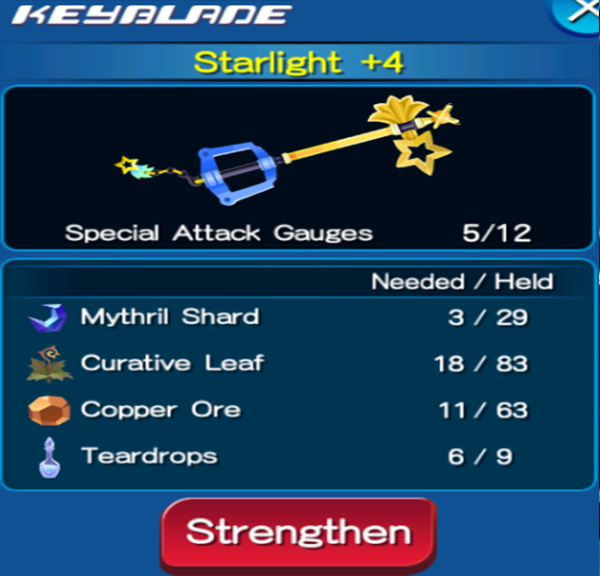 Each of the available Keyblades can be additionally leveled to further increase their special attack gauge and to increase the number of Medals it can hold which is no more than 5 Medals at a time. Some important things to remember while leveling. 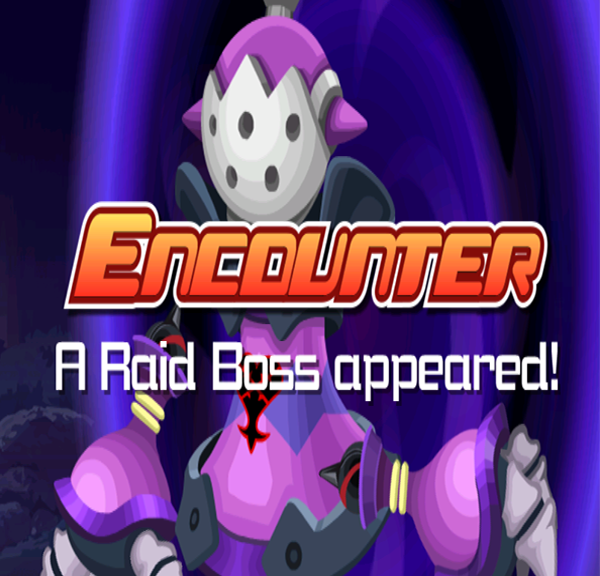 The best general method of Leveling in Kingdom hearts Unchained is to grind through the story line. Make sure you try to complete the objectives as you go for additional bonuses. You won’t run out of energy too fast and your energy replenishes when you level up. Material for your Keyblade can be found through completing the quest or by running over sparkly areas on the ground in each stage. Quickly run over these areas whenever you see them before you kill the targeted mob and end the stage. You will occasionally run into a raid boss fights. Starting out these aren’t that hard but they ramp up in difficulty each time you beat one. Don’t be afraid to tackle these on your own, whether you win or lose in these stages doesn’t matter. You receive a lot of Munny and Lux just by attempting to do it. These are time based so if you fail one, jump right back into it and try to finish the stage. You’re limited on inventory space unless you spend gems for additional space. 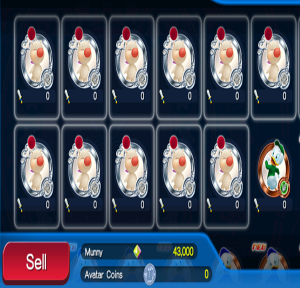 If you find this to be a problem, always sell your Moogle Medals. They are designed to be sold and usually have a high value. Next step to inventory management is to use or sell Medals. 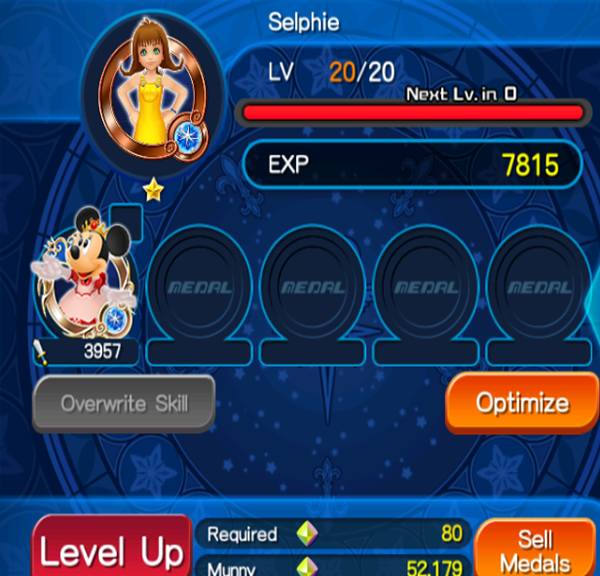 First make sure your currently equipped Medals are leveled up as high as you can get them. 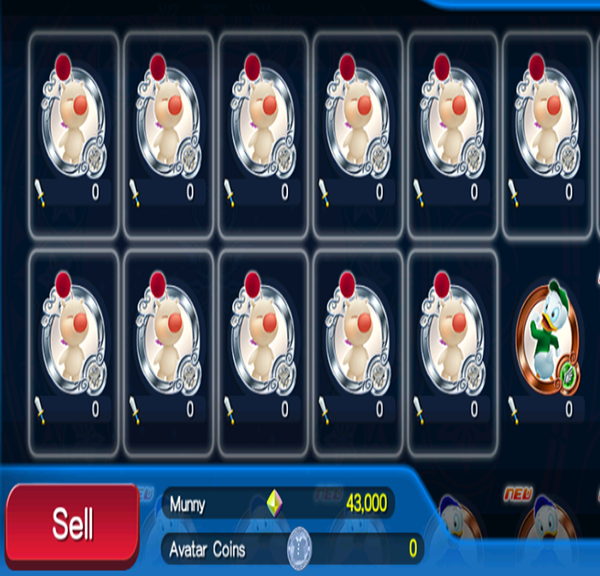 Then start selling the lowest ranking tier medals for Munny to clear inventory space, hold onto the silver medals as they provide great xp in the early game even if they aren’t a matching type. Try to Defeat enemies in a single turn! Go back to easier stages to prebuild up your special gauge for harder fights. Watch and Use the Special Event board to gather additional Medals and Materials. Complete objectives for Avatar Coins. Tap “Share” on a Medal to set it as the primary Medal that friends and party members will use. Unlock parts of outfits on the Avatar Board to get bonus HP, AP and Keyblade capacity. Save your Orichalcum until you’re sure you have the Keyblade you want to level up first. Always clear maps completely, early on in the game for the Keyblade Material. You can refresh the “Friends” menu by completely leaving the mission menu and reopening it. Save your Jewels until you’re at least level 20 or there is an event going that will get you 5★ Medals. Login daily to get the login Jewel rewards.